During the 1980s, a cat photo fad swept Japan. 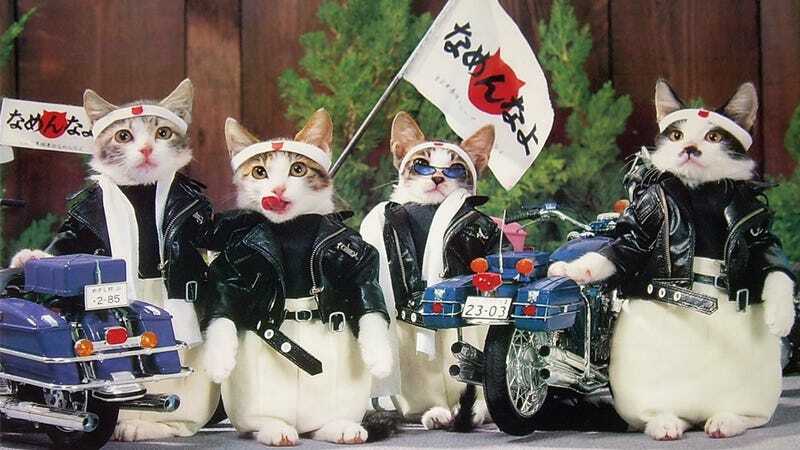 Dubbed "Nameneko" (なめ猫), the pictures featured feline friends dressed as high school thugs. The trend went global, spreading to the U.S. for a brief time. But this month, the trend's creator is in hot water for tax evasion. In 1979, the story goes that then young Japanese photographer named Satoru Tsuda found a stray cat near his home. He took the animal home and was later inspired to create his now famous photos after seeing the kitty play with his girlfriend's doll clothes. Tsuda came up with the idea for a series of photos of juvenile delinquent cats called "Namennayo Neko" or "Nameneko" for short. In Japanese, "neko" means "cat", while "namennayo" can either mean "Don't lick me" or "Don't mess with me". Here, it is used as a pun, with thuggish looking cats to complete the effect. The photos spawned picture books, photos, a video game, stationary, watches, phony driver's licenses with Nameneko pictures, a movie, and even a line of Topps trading cards in the U.S., featuring the cats in more American style outfits. In total, the "don't lick me cats" were licensed out for over 500 different items. Between 1981 and 1982, millions and millions of posters and fake Nameneko driver's licenses were sold in Japan. Tsuda became a rich man. As neat as the trend was, this story will end on a sad note: Recently, the now 62 year-old Tsuda has been charged with tax evasion to the tune of 100 million yen (nearly US$1 million). With the hidden earnings he made from other businesses, Sankei News reports that Tsuda bought brand name goods, watches, and had a Tokyo apartment. Through his attorney, Tsuda said he was sorry for any trouble this caused those connected to him. No word, if that included feline friends or not. Photos: photoライン！！, Niji, ナマケモノ, あるまじろ日記, にゃんだふるＬＩＦＥ, 42 LIFE ブログ, 蒼息吐息な日記, 1000 Things About Japan, FFFFound!